The Hyundai Elantra is like that slightly awkward kid from high school who existed quietly and studied hard. Not one to have a lot of friends or be outwardly outgoing, people always bypassed them to hang out with the popular kids. Now the awkward kid has grown up into a really successful doctor/lawyer/TV personality while the “popular kids” have moved on to become just older, fatter, washed-up versions of their high school selves working an unfulfilling job and wishing that they paid more attention to that awkward kid in class. Like that awkward kid, the Elantra has similarly gone on to not only catch up to the popular kids (the Honda Civic and the Toyota Corolla), but has actually surpassed them on nearly all levels. At the high school reunion, the Elantra will be the most interesting and successful person in the room, and the popular kids are just going to get drunk and sulk about how their lives turned out, slurring their words as they reminisce about the good old days. The harsh reality is that the Civic and Corolla became too used to being at the top, and they didn’t notice that Hyundai was improving its game and slowly encroaching on their territory until BOOM the Hyundai became the better car. A quick look at Canadian sales figures will paint a clearer picture. 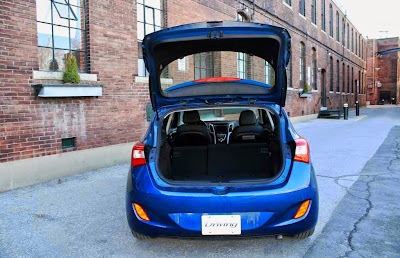 In 2014, 50,420 Elantras were purchased, compared to 66,057 Civics and 48,881 Corollas. So the Elantra sold more than the Corolla last year, and is getting closer to hitting Civic-level sales. This is a big deal, and people shopping in this segment need to consider the Elantra very seriously. The Hyundai Elantra just does so many things right. The Elantra is beautiful in its simplicity, but also highly functional and user-friendly. It doesn’t skimp on features and is an all-around admirable performer. 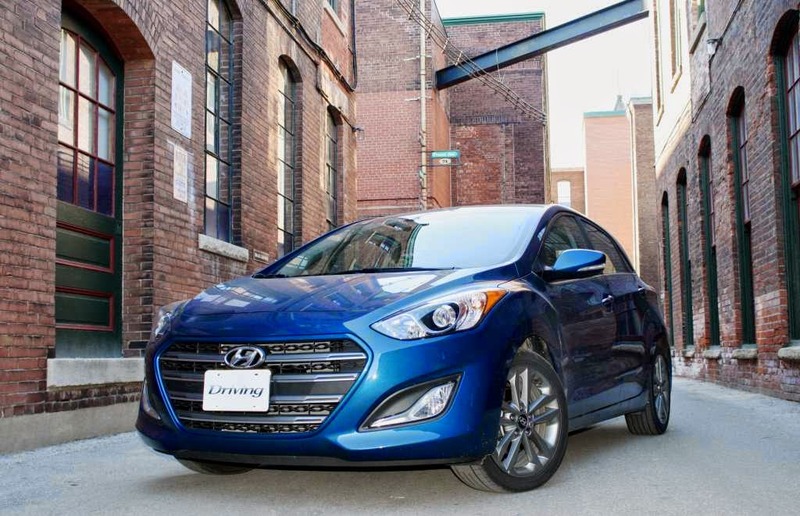 Nothing is frustrating about the Elantra, which is more than can be said of its two biggest competitors. Right when you get into the car, you’ll immediately be impressed by the interior. It’s not some space age, overly complicated mess of buttons that you’d need a Ph.D to decipher. Besides using nice-feeling soft materials, the dashboard layout is clean, uncluttered and totally logical. You’re never left wondering where all your controls are and there are no mystery buttons to confuse you. Everything in the interior has been well thought out and has a clear purpose. (The Civic, on the other hand, has an incredibly frustrating interior: Besides the awful two-tier dash, the placement of all the buttons is unintuitive, it doesn’t have a volume knob, and there’s a lot of hard black plastic.) On top of that, the cabin is very roomy and comfortable, my 6-foot-2 companion never feeling like he needed more space. Interiors are something automakers still struggle with. 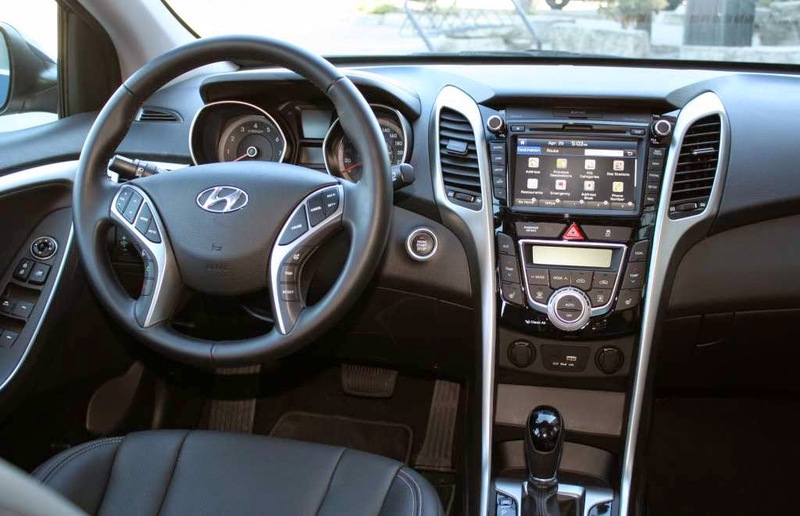 Not Hyundai, which balances a logical layout with nice materials and an intuitive interface to make the Elantra a nice place to spend time. The Elantra’s infotainment system is also one of the best I’ve seen (besides Chrysler/Dodge/Fiat’s UConnect system). The touchscreen is responsive and clean (you can’t see sloppy fingerprints), the graphics are modern, the menus are easy to navigate and everything is clearly labelled and easy to find. Everything from pairing your Bluetooth smartphone, to finding a radio station, and using the navigation is refreshingly simple. The system also allows a high level of customization for different levels of comfort with technology, something that many other automakers haven’t even thought of. During the drive, the Elantra GT also impresses. Powered by a 2.0L four-cylinder engine, it puts out a healthy 173 horsepower @ 6,500 rpm and 154 pound-feet of torque @ 4,700 rpm, which is more than the Civic and Corolla. The upside to a bigger engine is more power, but that means the Elantra GT’s fuel economy suffers slightly. The Civic and the Corolla are both more fuel efficient, but I’d take the Elantra’s extra power over fuel economy any day. Power delivery is smooth and quick, making passing cars and getting up to highway speeds a stress-free affair. The six-speed automatic also shifts smoothly and never seems to be confused as to which gear it should be in. Hyundai badges this Elantra as a GT, which stands for Grand Touring. 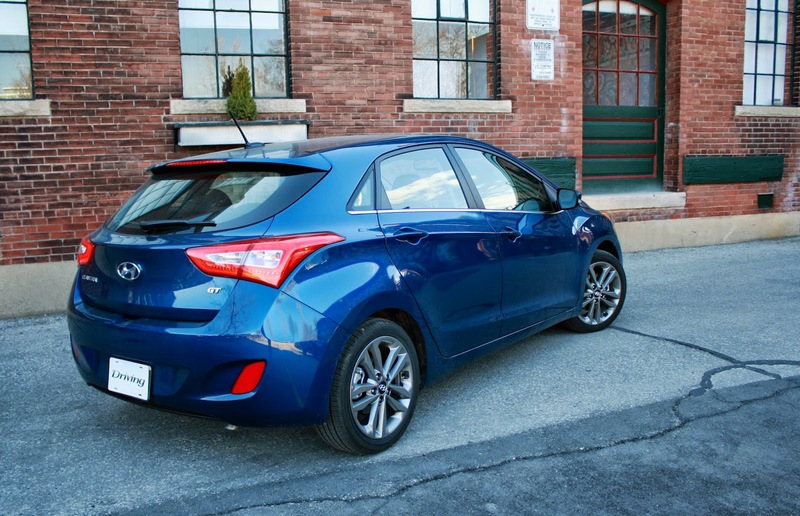 Typically, GT cars are sportier, but, in reality, the Elantra isn’t as sporty as Hyundai wants you to believe. Although the steering has a nice, heavy weight to it, it’s not a sporty setup. I prefer a heavier setup because it prevents twitchy highway driving, something that plagues a lot of compacts. The Elantra GT strangely has a very stiff suspension setup and three steering settings: Normal, Comfort and Sport. This is an odd choice because no one is going to buy the Elantra GT as a hot hatch, so having a super stiff suspension only makes the ride unnecessarily harsh. I would prefer a slightly softer setup so I wouldn’t get bounced around so much over rough roads. Despite this, I really enjoy how the Elantra drives. I like that it’s tighter, more responsive and less squishy than its competitors so you can drive it with more conviction. I would even argue that the Elantra looks better than the Corolla and the Civic. Its design is clean and confident, but not overly aggressive. It doesn’t rely on flashy design to overcompensate for a lack of substance, which its competitors are totally guilty of. The Elantra shows up to the high school reunion in a flattering knee-length black dress, the Civic/Corolla duo show up wearing a hot pink mini club dress and blue eyeshadow — they’re trying to hide something by using distraction tactics. The impressive Elantra GT is one of the best cars in its segment currently only surpassed by the Volkswagen Golf and Mazda3, which have both set the benchmark remarkably high. One day, the Elantra could surpass the Civic in sales and regale its friends with its “ugly duckling” story. For now, the Elantra GT can be quietly smug with the fact that it has become the better car, even though it might take people a little longer to recognize it. The Elantra will leave the high school reunion leaving a lasting good impression on its peers, which now have a lot of catching up to do.